I've been doing some more experimenting with LoRa recently, as I've got 1 of my 2 RFM95 working (yay)! While the other is still giving me trouble (meaning that I can't have 1 transmit and the other receive yet :-/), I've still been able to experiment with other people's implementations. To that end, I've been learning about a bunch of different words and concepts - and thought that I'd document them all here. The radio protocol itself is called LoRa, which stands for Long Range. It provides a chirp-based system (more on that later under Bandwidth) to allow 2 devices to communicate over great distances. The largest open implementation of LoRaWAN that I know of. If you hook into The Things Network's LoRaWAN network, then your messages will get delivered to and from your application server and LoRaWAN-enabled IoT device, wherever you are in the world (so long as you've got a connection to a gateway). It's often abbreviated to TTN. These values are a little different in different places - the above are for Europe on 868MHz. Going hand-in-hand with the Data Rate, the Maximum Payload Size is the maximum number of bytes that can be transmitted in a single packet. If more than the maximum number of bytes needs to be transmitted, then it will be split across multiple packets - much like TCP's Maximum Transmission Unit (MTU), when it comes to that. With LoRa, the maximum payload size varies with the Data Rate - from 230 bytes at DR7 to just 59 at DF2 and below. Often abbreviated to just simply SF, the spreading factor is also related to the Data Rate. In LoRa, the Spreading Factor refers to the duration of a single chirp. There are 6 defined Spreading Factors: ranging from SF7 (the fastest transmission speed) to SF12 (the slowest transmission speed). Which one you use is up to you - and may be automatically determined by the driver library you use (it's always best to check). At first glance, it may seem optimal to choose SF7, but it's worth noting that the slower speeds achieved by the higher spreading factors can net you a longer range. A Duty Cycle is the amount of time something is active as a percentage of a total time. In the case of LoRa(/WAN? ), there is an imposed 1% Duty Cycle, which means that you aren't allowed to be transmitting for more than 1% of the time. Often understood, the Bandwidth is the range of frequencies across which LoRa transmits. 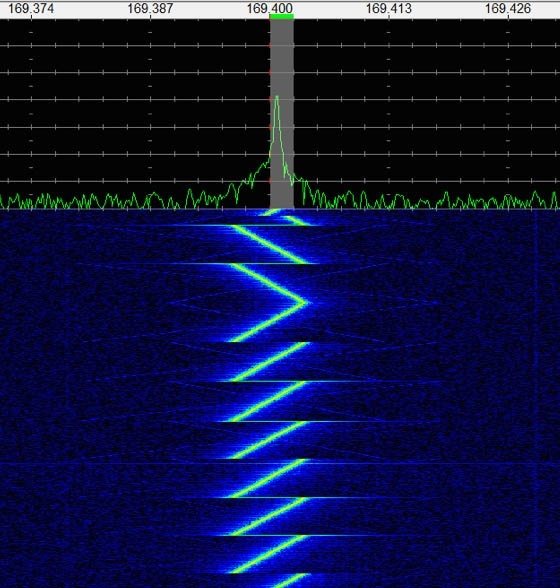 The LoRa protocol itself uses a system of 'chirps', which are spread form one end of the Bandwidth to the other going either up (an up-chirp), or down (a down-chirp). LoRahas 2 bandwidths it uses: 125kHz, 250kHz, and 500kHz. Frequency is something that most of us are familiar with. Different wireless protocols utilise different frequencies - allowing them to go about their business in peace without interfering with each other. For example, 2.4GHz and 5GHz are used by WiFi, and 800MHz is one of the frequencies used by 4G. In the case of LoRa, different frequencies are in use in different parts of the world. ~868MHz is used in Europe (443MHz can also be used, but I haven't heard of many people doing so), 915MHz is used in the US, and ~780MHz is used in China. Found this helpful? Still confused? Found a mistake? Comment below! Could it be? Wireless communication for internet of things devices that's not only low-power, but also fairly low-cost, and not only provides message authentication, but also industrial-strength encryption? Too good to be true? You might think so, but if what I'm reading is correct, there's initiative that aims to provide just that: LoRaWAN, long-range radio. I first heard about it at the hardware meetup, and after a discussion last time, I thought I ought to take a serious look into it - and as you can probably guess by this post, I'm rather impressed by what I've seen. Being radio-based, LoRaWAN uses various sub-gigahertz bands - the main one being ~868MHz in Europe, though apparently it can also use 433MHz and 169MHz. It can transfer up to 50kbps, but obviously that's that kind of speed can also be reached fairly close to the antenna. Thankfully, the protocol seems to have accounted for this, and provides an adaptive speed negotiation system that lowers data-rates to suboptimal conditions and at long range - down to just 300bps, apparently - so while you're not going to browsing the web on it any time soon (sounds like a challenge to me :P), it's practically perfect for internet-of-things devices, which enable one to answer questions like "where's my cat? It's 2am and she's got out again....", and "what's the air quality like around here? Can we model it?" - without having to pay for an expensive cellular-based solution with a SIM card. It's this that has me cautiously excited. The ability to answer such questions without paying thousands of pounds with certainly be rather cool. But my next question was: won't that mean even more laughably insecure devices scattered across the countryside? Well, maybe, but the LoRa alliance seems to have thought of this too, and have somehow managed to bake in 128-bit AES encryption and authentication. The IoT device sends a message by radio to the nearest gateways. All gateways in range receive the message and send it to the network server. The message travels through the internet to the network server. 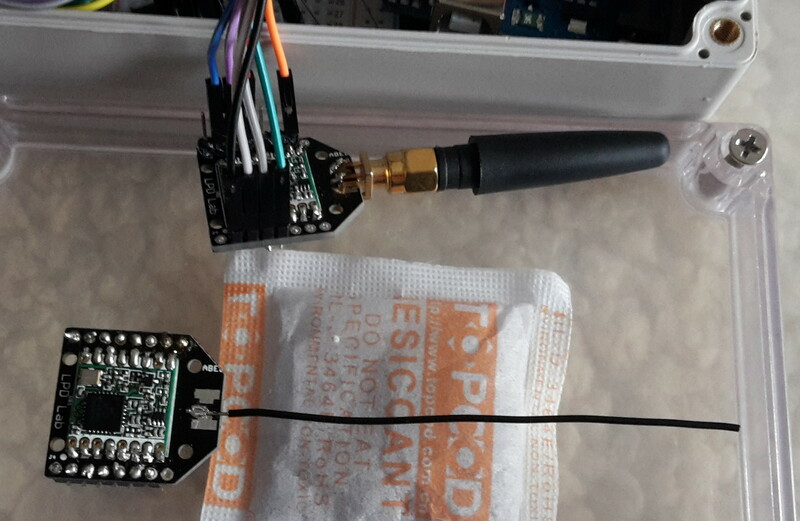 IoT Device: The (low-power) end device sending (or receiving) a message. Gateway: An internet-capable device with a (more powerful) LoRa antenna on it. Relays messages between IoT Devices and the requested network sever. Network Server: A backend server that sends and receives messages to and from the gateways. It deduplicates incoming messages form the gateways, and sends them on to the right Application Server. Going in the opposite direction, it remembers to which gateway the IoT device has the strongest connection, and sends the message there to bee transmitted to the IoT device in the next transmit window. Application Server (not pictured): The server that does all the backend processing of the data coming from or going out to the IoT Devices. Very interesting. With the network structure out of the way, let's talk about that security I mentioned earlier. Firstly, reading their security white paper reveals that it's more specifically AES 128 bit in counter mode (AES-128-CTR). Secondly, isn't AES the Advanced Encryption Algorithm? What's all this about authentication then? Well, it (ab? )uses AES to create a CMAC (cipher-based message authentication code) for every message sent across the network, thus verifying it's integrity. The specific algorithm in use is AES-CMAC, which is standardised in RFC 4493. Reading the white papers and technical documents on the LoRa Alliance website doesn't reveal any specific details on how the encryption keys are exchanged, but it does mention that there are multiple different keys involved - with separate keys for the network server, application server, and the connecting device itself - as well as a session key derivation system, which sounds to me a lot like forward secrecy that's used in TLS. Since there's interest at the C4DI hardware meetup of possibly doing a group-style project with LoRaWAN, I might post some more about it in the future. If you're interested yourself, you should certainly come along! Welcome back to another demystification post! This time, it's about microphones. I had a question recently about microphones and phantom power, and after doing some rather extensive research on the subject (unintentionally of course :P), I thought it a waste not to summarise it here. Basically, phantom power is a +48V direct current that's transmitted through a microphone cable (not the kind you plug into your laptop I don't think - the big chunky ones). It's required by condenser microphones (though some use a battery instead), which have a pair of films (called diaphragms) which vibrate. When a current is passed through from one plate to the other, the physical sound gets converted into an electrical signal we can use. Condenser microphones are much more sensitive than their dynamic microphone counterparts. They are able to better represent a wider range of frequencies - but as a result of this heightened sensitivity, you normally need a pop filter if you're recording vocals. In addition, they don't tend to perform too well in loud environments, such as concerts. Finally, they tend to be more expensive than dynamic microphones, too. Dynamic microphones, on the other hand, don't require phantom power. They are basically a loudspeaker in reverse and generate the current themselves - they have a single diaphragm that's attached to a metal core - which in turn has a coil of wire around it. When the diaphragm vibrates, so does the metal core - and as you can probably guess, a current is induced in the coil, as metal cores tend to do when inside coils of conveniently placed wires. While they are better in loud environments (like concerts and drum kits), dynamic microphones aren't so good at representing a wide ranges of frequencies - and as such they are usually tailored to be pick up a specific frequency range better than others. Furthermore, they aren't as sensitive in general as your average condenser microphone, so they don't get on particularly well with very quiet sounds either. Which you use generally depends on what you want to do. If you've got an overly enthusiastic drummer in a rock concert, you probably want a dynamic microphone. On the other hand, if you're trying to record the song of a cricket on a still summer's evening, you probably want to keep a condenser microphone handy. My new Raspberry Pi 3! I've got a little project in mind - I'd like to build a little storage server to back some things up to. It doesn't have to be anything terribly fancy, provide blisteringly fast speeds, or have store a huge number of files, so I've opted for a Raspberry Pi 3 to power the thing. 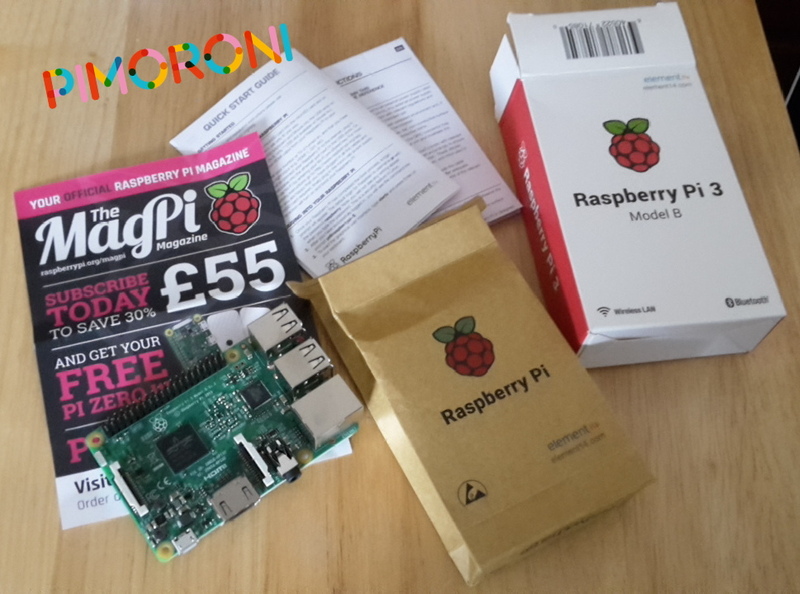 It arrived just recently, and since the service I got from Pimoroni was excellent, I thought I'd post about it here. If you're after some bits for your raspberry pi, then they are a good reputable place to get them from. In order to access the storage space on the server, I'll be configuring some samba shares (linux's implementation of Windows file shares, which is completely interoperable). Would anyone be interested in a tutorially kind of post on how you configure Samba? Let me know in the comments below.